Rhodolite Garnet (Pear) Bracelet (Size 7.5) in Platinum Overlay Sterling Silver 14.000 Ct. Silver wt. 10.00 Gms. The pomegranate exquisiteness of garnet is a delight you definitely need. Clasp on the hypnotizing beauties that we have to offer and preen in the compliments that come flowing your way. Our collection of the best designs ensures that you get just what you’re looking for. We have got all the imaginable designs and outlays covered so you can adorn the kind of jewellery that you like. So, come on and scroll through the entirety of our collection of the bestselling garnet bracelets to find what you’ve been looking for. The high-class glamour of a suiting tennis-style jewellery piece is eternal. And you’ll get the best of it in our tennis bracelets. We have pieces with a uniform and stately embellishment of the stones with and without refined designs. Other than that, we also offer two main types of tennis bracelets, which are: single-strand tennis bracelet and multiple-strand tennis bracelets. As the category titles suggest, there are different numbers of rows in our variety. Another exquisite feature of our charming range promises you a snug fit. Do you also worry if the bracelet is going to fit, every time you order one? Well, you don’t have to fret anymore. We have a remarkable class of the best garnet bracelets in UK with adjustable fitting, so you have the snug and comfortable wear. One of the biggest reasons why you must shop from our array is because of the quality we provide. You’ve seen our rich diversity and now you should know how we guarantee high-end products. It’s rather simple; we source our gems straight from the mines. 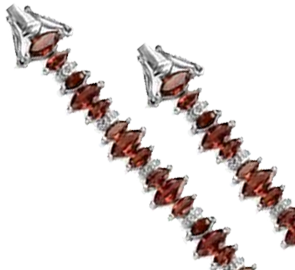 It ensures we only offer you real garnet bracelets in UK and keeps you coming back for more. Another big reason is because we offer prices you won’t find anywhere else in the market. Because we get our gems from the mines, it means that we don’t have to pay the middlemen, which eventually brings down the per-product prices and enables us to offer you an assortment of affordable garnet bracelets.